Recently purchased a 2008 Eclipse Attitude 21LB and after getting it home, discovered the bent spring hangers on drivers side and cracks on both sides. Looks like axle hit the bottom of frame on the passenger side. Didn't bother to look at frame when purchasing since the rest of the trailer looked mint. Exactly what happened to my old rig. My opinion was the spring hangers make the bottom of the I=beam flex back and forth, causes the I beam to crack horizontally. It's only an 1/8" thick piece of steel to begin with. Lippert was a PITA to deal with, had me sign some stupid document for them to send me repair instructions. Doubt they'll cover anything for you, mine was only 4 years old and they did nothing. Here's what I did- Weld both sides of the crack, inside and outside. 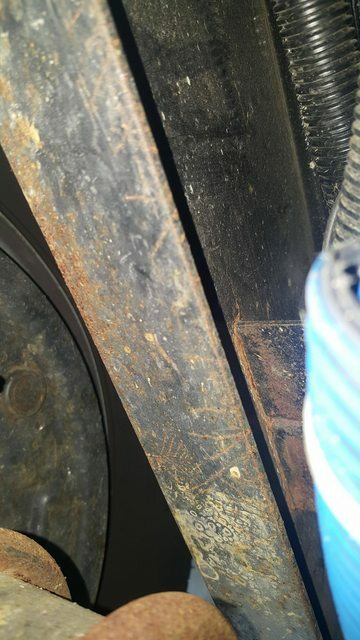 Put a piece of steel over the welded crack and weld it to the frame. We then made a gusset that went from the bottom edge of the I-beam to the new plate. We only put the gusset on the outside. That will stop it from flexing in the future. Had no issues after that, but I only had the rig for another couple of years. Far as I know it's still on the road and no more cracks. Exactly what happened to my old rig. Thanks for the info Mike! Was your main IBeam bent also?You can see in the pics how far off the hangers are from front to rear and how the Ibeam bends. I didn't notice that till I looked at your photos again. I would think if you put a straight edge against the frame it won't be bent. That's a pretty big piece of steel to bend that way. 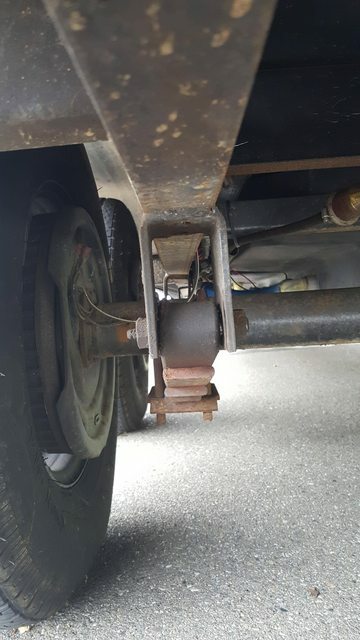 I think you might have some other issue, like maybe the axle itself is bent and the way the springs are mounted to it, it twisted the springs. Could be the hangers themselves are bent, giving it an optical illusion? All of this is just guessing on my part. BTW- on mine it cracked both sides, same area, so make sure you check the other side. 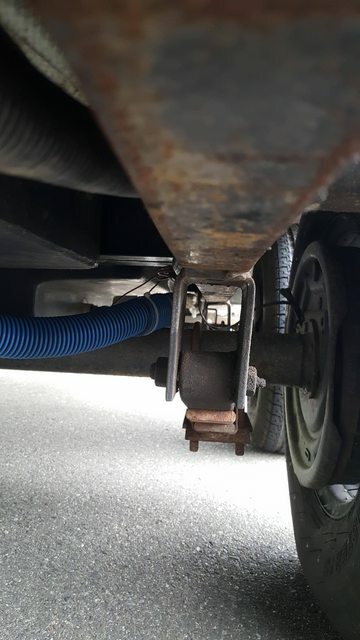 No optical illusion, the drivers side is definatley bent outward only between the tires and caused the hangers to bend also. IBeams on both sides are cracked in the same locations right above the spring hangers also. 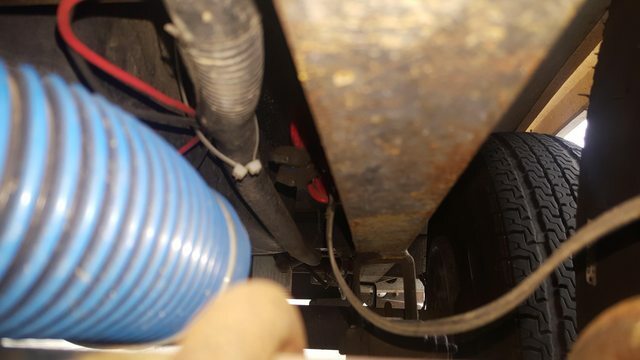 Looks like the passenger side hit a bump and when the axle ubolt contacted the bottom of the frame, it pushed the drivers side IBeam out,...maybe. I would bet the beams flexing and bending are the origin of the damage. Trailers have had that problem before. Not enough lateral structure to keep the main beams straight. You have a serious problem on your hands. A very expensive one. Retail the repair will be pretty steep because the main structure of the trailer is compromised and many welding shops will not want to take the future liability after a repair. 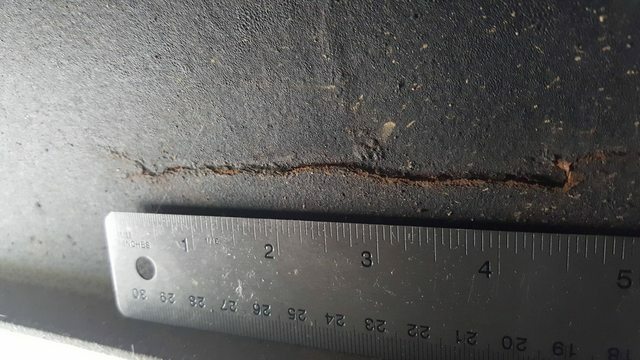 You dont know the extant of the damage to the rest of the structure while the beams were wobbling around under the floor. You might consider going back to wherever you bought the trailer with your findings and see if you can reverse the purchase. 2018 Ram 2500 HD Mega cab. I knew it would be pricey to fix and willing to put $2500 into the frame repair. Figured knowing what I know now, if I bought another trailer, I would go ahead and reinforce that frame anyways. Sttuctural integrity of the wood frame has me a little worried though. Probably occurred from being loaded at max weight or even a bit overloaded and then making a very sharp turn. The greater the load the less the tires will scrub and something's going to give. Anything can be fixed and the frame can be reinforced. Not sure how handy you are with a mig welder and grinder but that's something I'd tackle myself. Weld and grind the cracks then weld on reinforcement plates over those areas. Maybe even stitch weld a long plate within the I-beam stretching past each axle. No real need to get the frame perfectly straight as long as you get the hangers back in alignment measuing from the tongue. I would even reinforce the hangers. Given the room, you could even weld in couple of additional cross members. One other thing to check on these is sufficient outriggers from the frame supporting the side walls. I'm not sure if Attitude had that problem but it was a big problem with Weekend Warriors. 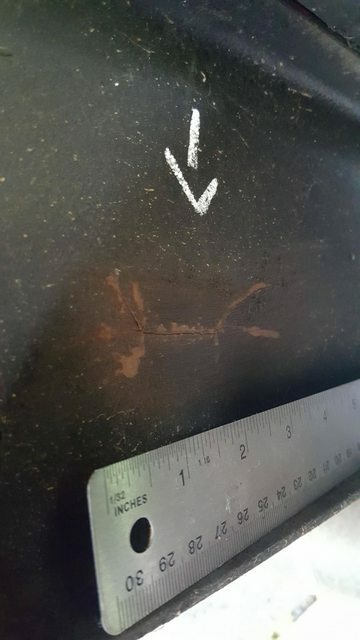 I concur with several assessments above, this does not look like a difficult repair for any halfway talented welder. They can repair the cracks and reinforce, add box tubing crossmembers where the hangers mount to the frame to straighten it and keep it straight. They could even frame out box tubing and simply put a 2 inch lift on the trailer and mount everything to brand new steel if you wanted. Replace hangers, springs and axles and you should be good to go. A lot of people reinforce the hangers on new trailers by adding a flat plate on the outside ends to strengthen them. This would be a great opportunity to add when you do the repair. If the rest of the trailer is mint I would not even stress about this. There is some silver lining here. When buying any used trailer, there’s no better feeling than replacing all the rolling hardware yourself. Now you will know exactly how well it is taken care of when you hit the road. The rest of the trailer is mint however the quotes for the welding, frame straightening, spring, hangar and reinforcing are averaging between $5-7K. The frame shop is well known and frame machine runs $125 hr and there is a waiting list. The rest of the trailer is mint. Not sure about the wood structure. However the quotes for the welding, frame straightening, spring, hangar replavement and box reinforcing are averaging between $5-7K. The frame shop is well known and frame machine runs $125 hr and there is a waiting list. Yup! That is pretty steep. Sorry for you problems. My bent frame was straightened and reinforced for about $2200 in northern Arizona.